My kids left for school in their pajamas. Today, the school cafeteria served green-dyed eggs and ham to celebrate America’s favorite rhyming doctor. But I like to think Dr. Seuss, author of the Lorax, would prefer the green eggs I ate this morning. The eggs I scrambled came from a new vendor at the Oxnard Farmer’s Market. Before I purchased, I asked him about their farm practices. 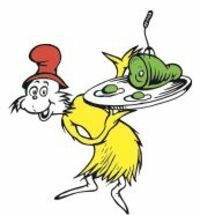 I was happy to learn he offered green eggs, as his birds are raised exclusively on rain-fed pastures in Kern County, California. Water footprint researchers assigned colors to water to help differentiate the types of water sources: blue, green and gray. Blue water is sourced from aquifers, reservoirs and rivers that scribble across the landscape. Gray is water tainted with nitrogen, the run-off from fertilizer and manure. Rain water and moisture is green, thus not diverting water from its natural system. Green eggs can be found across America. They are available for purchase at farmer’s markets and a growing number of grocery stores. Look for organic brands that say they are pasture-raised like the eggs from Organic Valley Farms and Coyote Creek Farms. Sam-I-Am urged us to try something new. Consider approaching your food in a new way too, and eat less water at the kitchen table.